weather…. | Write Early, Write Often…Write Something! …what was it Mark Twain said? Every one complains about the weather, nobody does anything about it. Well. That was then. This is now. And now when it rains, what you hear is, ‘we needed that.’ Seriously? My back yard grass is green because it’s molding. Even the dogs have a problem going out there and pooping on the wet grass. And, who’s going to not agree? The dogs are right. It’s yucky. And, yet. My darling adorable husband continues to water the yard. The sprinklers are set for 6 minutes every Monday, Wednesday and Friday. I say, God is providing the water free of charge, turn off the sprinklers. But no. Then there’s the puppies. 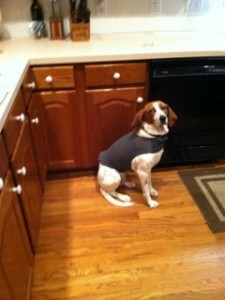 Missy, pictured, in her Thunder Shirt. Because when it storms we may be watering outside but inside she’s in the closet. I think the shirt holds her bones and skin together, otherwise it would all just fall apart because of the shaking. Must be the ears. Because I feel certain Missy can hear the thunder in Virginia and we’re about a hundred plus miles from the next state. Sammy on the other hand would rather be out in it, not just watching it through the study window. I do love the way the weather forecasters predict the percentage of chance that it might rain. Or snow. Or be sunny. Like they can really predict? No. But we tend to believe more and more, that’s why there’s a weather channel, which I find to be the most amazing channel on cable. 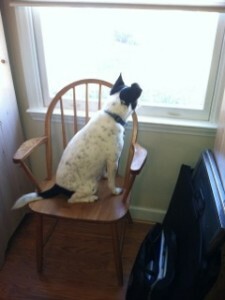 This entry was posted in Musing on 2012/05/28 by teresafannin.